Compression Ratio I alternator. 3.0g petrol, 5ptoil. Telescopic/pf. Tyres, 3.60 x 19in (fr), 4.10 x 18in (r). 3801b. 90mph. 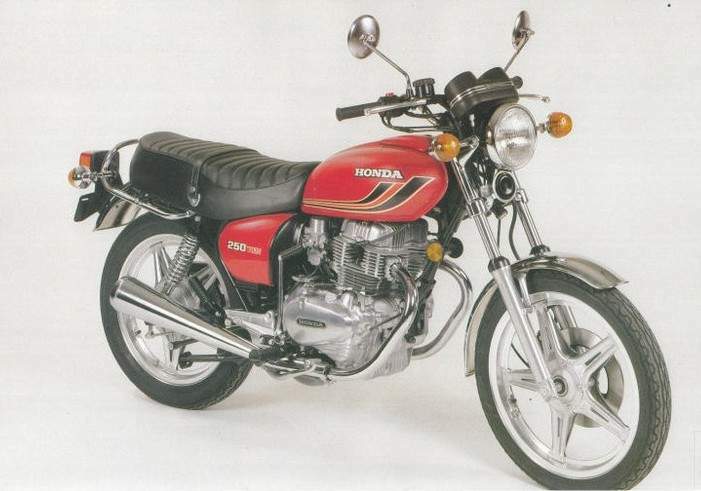 After years of marketing success for the CB250, replacement of the CB72, Honda finally showed themselves to be aware of the ever-deepening boredom induced among enthusiastic motor cyclists by the staid ways of that top-selling machine. They were probably concerned, too, about the inroads in their sales made by more sporting 250s such as Kawasaki and Yamaha two-strokes. The outcome was a complete redesign, and the launch in 1977 of the 2-50T, companion to the near-identical 400T. With a three-valve head two valves for inlet) and ultra-short stroke, the new model produced more power than the earlier design, operating on two valves per cylinder; the difference was big enough to allow the fitting of counter-weights to the crankshaft without prejudicing a useful increase in bhp at the rear wheel, translating into a top speed of about 90mph, which was at least 7mph up on the best figure recorded for the older machine. Known as the Dream, the Honda managed to be both tall and a shade portly — the impression being backed by the fact of its 380lb dry weight — yet handled well, thanks mainly to the controlled wheel movement provided by new FVQ rear shock absorbers with fully exposed springs. Electronic ignition promised freedom from maintenance, and a sporting touch to redress the otherwise stolid look was present in the Comstar wheels, patterned on those fitted to the endurance racers. Prudently, as fuel costs soared in the 1970s, the petrol filler was lockable.